Artificial floating island in the Mur river in Graz, Austria, containing an open-air theatre. Built 2002-2003 by Vito Acconci after an idea by Robert Punkenhofer. 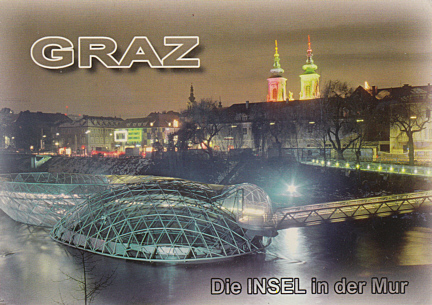 Front Text: "Graz", "Die Insel in der Mur"
Reverse Text: "Landeshauptstadt Graz, Steiermark - Austria, Kulturhauptstadt Europas 2003"